The UNSW Medicine program has a curriculum where medical science and clinical disciplines are highly integrated to ensure an optimum learning experience. UNSW Medicine has developed an innovative six year, three Phase undergraduate Medicine program. The program leads to the awards of Bachelor of Medical Studies/Doctor of Medicine (BMed/MD). Development of student autonomy in regard to assessment through involvement in some self and peer assessment, some negotiation of assignments and projects, and the process of selecting and reflecting on student's evidence for learning in the capabilities for the portfolio examinations. These characteristics of the assessment scheme have been designed to encourage active learning and to support interdisciplinary integration. 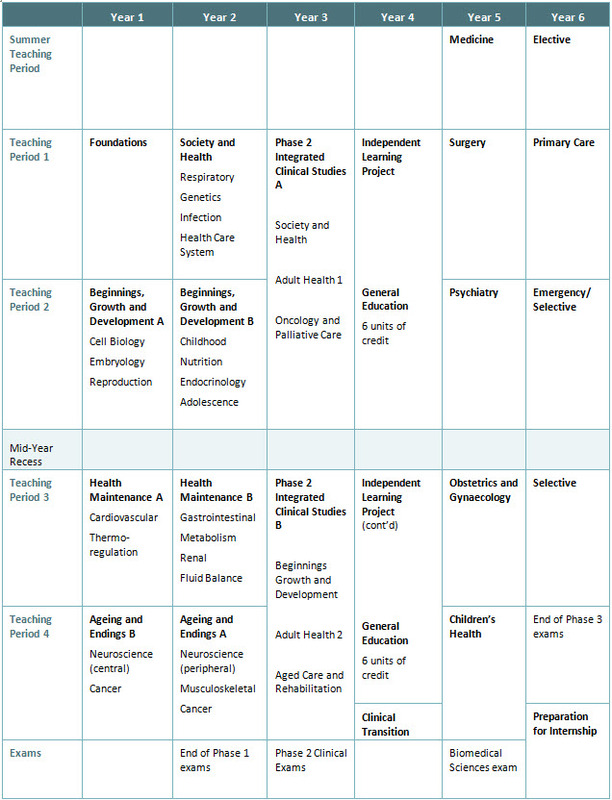 The UNSW Medicine program is based on the achievement of eight desired capabilities by graduation. Each graduate capability has an average of 5-6 elements to be achieved in each phase and the assessment system is structured to measure achievement of these elements. The eight graduate capabilities are grouped into a set of three central pillars that run through the entire program (see table below). The development of core personal attributes in students and interactional abilities will occur through specific activities and as an inherent part of the learning process. The third capability emphasises the application of knowledge and skills in medical practice. The six-year program is divided into three Phases: scenario based learning, practice based learning and independent reflective learning. Four domains organise the program throughout the three Phases. Three of these domains represent the stages of the human life cycle, the fourth represents the environment in which life exists. Within each domain there are four major themes, which are key concepts important to understanding health, illness and medical practice. Themes provide a broad issue for students to explore and students will revisit the theme in different contexts throughout the three Phases. The content includes aspects of proactive and reactive approaches to health issues in individuals and populations, and is organised into three content streams, biomedical sciences, the social and psychological aspects of health and illness, and medical practice. Within each Phase, vertical integration occurs with students working together collaboratively. (For example, first and second year students are combined in Phase 1 in the second half of the year.) This means that students play both learner and mentor roles as they progress through Phases 1, 2 and 3. Note: The sequence of courses is illustrative of one possible sequence. Course sequences will vary for individual students. Within each domain, there are four major themes (see table below). These 16 themes are key over-arching concepts considered critical to understanding health, illness and medical practice. The majority of teaching in Phase 1 of the curriculum (first 2 years) occurs on the main university's Kensington campus and includes lectures, small group work, tutorials and practical classes held in laboratories. During this Phase, clinical sessions are held in hospitals. In Phase 2 of the program (next 2 years), the clinical sessions held in hospitals increase to 3 days per week. Campus teaching (lectures, small group work, tutorials and practical classes) are held on the other 2 days per week at the Kensington campus. Phase 2 also includes the Independent Learning Project. In this unique learning experience, students undertake a supervised research project of their choosing. In Phase 3 of the program (final 2 years), almost all teaching is conducted in hospitals. It incudes bedside tutorials, classroom tutorials, ward rounds and attendance at clinics. Lectures held on the main university campus also form part of the teaching program in this Phase. In all three Phases of the program, students will be required to travel to various clinical environments associated with UNSW. These will be the predominant locations for learning in Phases 2 and 3, and will include at least 4 weeks in a non-metropolitan setting and for a quarter of students will include between one and two academic years in a non-metropolitan setting in Phase 2 and/or 3. It is expected that students who gain entry via the Rural Student Entry Scheme will be allocated to a rural hospital and undertake at least either Phase 2 or Phase 3 in rural hospitals. Other local students may have the option or be required to undertake at least either Phase 2 or Phase 3 in rural hospitals and all local students should expect at least 4 weeks in a rural rotation in Phase 3. Students considering applying for entry into UNSW Medicine must be willing to undertake their training in a range of hospital and health care facilities. For further information please refer to the UNSW Medicine Policy on Allocation of Students to Clinical Environments.